Denny Jump (Bellevue, WA, United States) on 15 February 2012 in Landscape & Rural and Portfolio. The Heron (if you can see him) has to be singing that Tom Waits song "Cold Water" (sorry, Richard ;-) ). Words and Music by Tom Waits. This is very beautiful, Denny. And I can see the heron there! Just beautiful! It's a great composition Denny. @Bill Brown: Hi Bill - Thank you very much, sir!! After you noticed the presence of the heron, you see only him ! @Gérard Beullac: I agree - Thanks very much, Gerard! Superb composition Denny. I wonder how long the Heron stood there before it couldn't feel it's feet ! @Doug: He is a long time resident of this creek I have learned but he probably had wading boots on, this day! Almost like a where's wally. Took me a few moments to spot him... but got there in the end. Wonderful feeling of actually how cold it was. Oh, I love the blue color cast to this image, Denny - it really gives a senses for how cold it is. How'd you like to dip your feet in that like the heron? This is perfectly perfect Denny! The blue tones make my shiver just thinking about the cold, cold water! @Tracy: Thank you so much, Tracy - I appreciate it...but funny the things you DON'T notice...I just noticed this morning looking at this that i should have leveled this puppy just a tich. It's leaning to the right like Speaker Boehner! This photo feels cold. I love how you quote songs to the photos. The mood fits. Beautiful winter scene...although it is cold. nice capture. wonderful 'blue mood' again, denny! i had taken a look at your today's post before leaving for a walk with nelly ... and then i encountered some white herons on 'my' creek as well! of course i had my camera with me ... what a coincidence! The tone of this makes it VERY COLD water. @Ralph Jones: Thanks Ralph - it sure does - this is how it looked too...crazy! Mr. Heron seems not to mind the cold. I'll bet the fish aren't real active though. This is very beautiful ,i lime this,best regards oivatytto,,haleja. @Judy aka L@dybug: Hi Judy - Thank you..No our water has remained hot but THIS water here was rrrreeeeaaaallll cold! Another great capture of this river! A great choice to crop this shot so that it fills your entire frame. I love how the frosted trees come right up to the water's edge, creating a nice contrast. 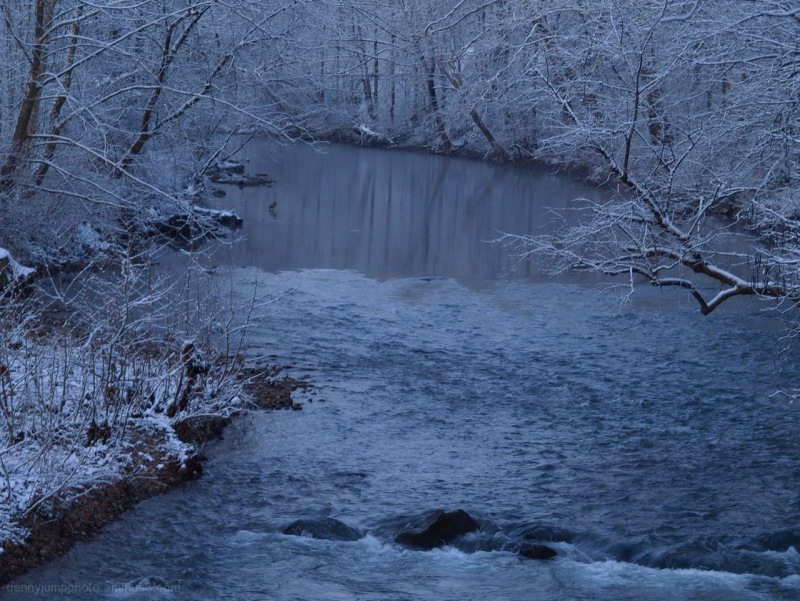 Beautiful smooth tones and color, lovely winter scene ~ fantastic capture Denny! @RBL: Thank you so very much Ruthie ;-) I loved yours for today! Beautiful image. It definitely looks cold! Wonderful tones of cold here, Denny - and that heron is sure making a good job of being invisible. Nice capture..must be very cold there! You really captured the cold here, Denny. Nicely portraying the point where the still water begins to rush. Beautiful textures and framing.